Zombikeys: Keycaps for Zombie Lovers | Nerd Much? We’re a big fan of zombies. 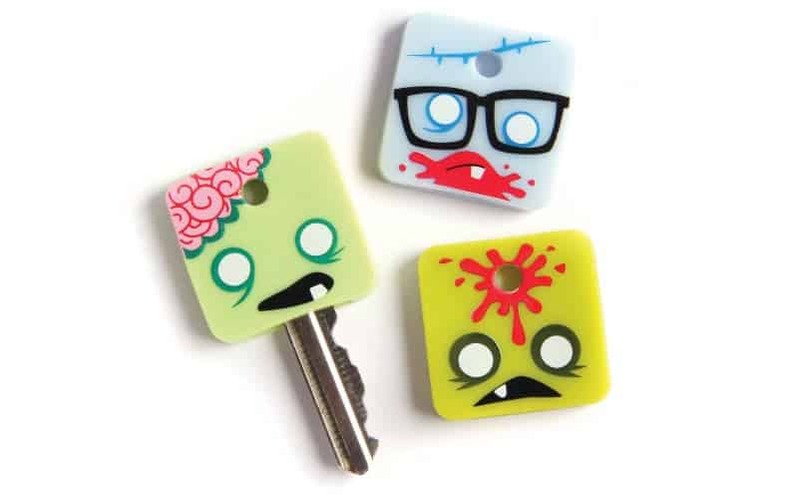 And if you’re looking for a small way to brighten your everyday commute, check out Zombikeys, which are zombie head key toppers. Each key cap is designed to look like a cute cartoon zombie head, complete with discolored skin, brains, and blood. They’re well designed, and each pack comes with 6 different toppers. Each key topper measures 1.25″ x 1.25″ x .2″, so they’ll fit most standard keys. No, they don’t do anything cool nor are they revolutionary, but they’re a great way to inject a bit of your fun side into your daily life. These monstrosikeys (count it) by GAMAGO will help you organize your keys, too, since each one is unique. Stay tuned to Nerd Much for more Cool Stuff to waste your money on.